Sunday Island Mission was established in 1899 as a private mission by Sydney Hadley. It was run by the Australian Aborigines' Mission (1923-1929) and the United Aborigines Mission from 1929 to 1934 when it relocated to Wotjulum (1934-1937) before returning to Sunday Island. From 1905, children at Sunday Island were under the guardianship of the departments responsible for Aboriginal welfare. The Sunday Island Mission was established by Sydney Hadley in 1899, near the entrance to King Sound. Hadley had previously been at Forrest River Mission and in 1884 took a pastoral lease over Lombardina. Hadley has been credited for speaking the local language and not attempting 'to break down the traditional culture' of the Aboriginal people in the area, but he was accused of taking 'wives' from among the young Aboriginal girls. This was known to the authorities but they did not, as Hadley urged, have a public inquiry. Missionaries from the Australian Aborigines' Mission (AAM) volunteered at Sunday Island from the early 1900s. Longworth (p.149) has suggested that the AAM was also prepared to 'overlook the allegations of sexual abuse of young girls, either believing the allegations to be untrue or that Hadley had reformed following his conversion to Christianity prior to 1899'. In evidence given at the Roth royal commission in 1905, the Sergeant of Police at Broome, John Byrne, stated that Hadley was 'a missionary at Sunday Island' and was 'a very honourable man'. According to the State Solicitor's Guide to Institutions Attended by Aboriginal People in Western Australia, the Chief Protector of Aborigines discovered that Hadley had been allowing 'traditional practices' to continue, was alleged to have been initiated into a local tribe and had taken three Aboriginal wives. Hadley was replaced but was later reinstated and remained as superintendent until 1923, when he sold Sunday Island to the AAM. In 1929, the United Aborigines Mission (UAM) took over from the AAM. In 1934 the mission moved off the island to the mainland near Yampi Passage and Cone Bay. At this time it was renamed 'Wotjulum'. By February 1937 the mission returned to Sunday Island. Missionaries from the Australian Aborigines' Mission had volunteered at Sunday Island from 1910. Bertha Telfer, a missionary with the AAM, went to Sunday Island in 1913 and then again in late 1915 to replace Horace and Mrs Smith. The Australian Aborigines Mission (later UAM) took over Sunday Island Mission from 1923. The Chief Protector of Aborigines was the legal guardian of children at Sunday Island Mission. Evidence in relation to Sunday Island mission was taken by the Roth royal commission. The Aborigines Department had responsibility for the welfare Aboriginal children housed in Sunday Island Mission. Cosmo Newbery Mission was started by United Aborigines Mission personnel, Harry and Ethel Lupton, who had previously been at the Sunday Island Mission. Sydney Hadley, who had run the Forrest River and Sunday Island Missions, had held the pastoral lease at Lombadina since 1884. Sources used to compile this entry: 'The Treatment of Aborigines', Western Mail, Charles Harper, J.W. Hackett, James Gibey, for the Western mail office, Perth, 14 October 1905, p. 44, http://nla.gov.au/nla.news-article37807591; Green, Neville, 'Missions', in Gregory, Jenny and Jan Gothard [editors] (eds), Historical Encyclopedia of Western Australia, University of Western Australia Press, Crawley, W.A., 2009; Guide to Institutions Attended by Aboriginal People in Western Australia [Document], Date: 1834 - 2005; Longworth, Alison, Was it worthwhile?, An historical analysis of five women missionaries and their encounters with the Nyungar people of south-west Australia, Murdoch University, Murdoch, Western Australia, 2005, http://researchrepository.murdoch.edu.au/163/2/02Whole.pdf. 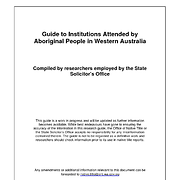 pp.148-49, 153.; State Solicitor's Office of Western Australia, 'p.130', Guide to Institutions Attended by Aboriginal People in Western Australia, Government of Western Australia, 2005, http://web.archive.org/web/20140126131607/http://www.dpc.wa.gov.au/lantu/MediaPublications/Documents/Guide-to-Institutions-attended-by-Aboriginal-people-in-WA-2005.pdf; 'Western Australia Protectors Reports 1899-1959', in To Remove and Protect: Aboriginal Lives Under Control [website], Australian Institute of Aboriginal and Torres Strait Islander Studies, National Library of Australia, http://aiatsis.gov.au/collections/collections-online/digitised-collections/remove-and-protect/western-australia. Annual Report of the Commissioner of Native Affairs 1938, p.21..